This record is the fruit of a collaboration between two musical entities, both close to the environment that bred them, and is an answer to the derelict post-industrial era. 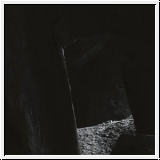 The recording sessions took place on several days and locations keen to trance-inducing effect – such as a prehistoric cavern that was used for rituals for thousands of years. Those spaces are distinctly tangible through the recording, not limiting the music to a simple set of layers of rhythms and textures. Instruments range from acoustic traditional instruments to electronics through DIY lutherie and prepared instruments – traces of so many imperceptible influences. This project is beyond genre : dark ambient? industrial? drone ? black metal ? ritual music ? improvised music ? This album is totally written, and if the threshold is a gate to chaos, only one Order and one direction are possible.